Description: Share Facebook Status and View Facebook Stream Updates. Reply Comments or Messages without using Facebook via Chrome Extension. Do you want to share your status updates on Facebook without using official website? Do you want t o view your Facebook news feed without Login to official website? In this guide, we will help you to get the notifications without going to Facebook. As we all know, Facebook is now become a no. 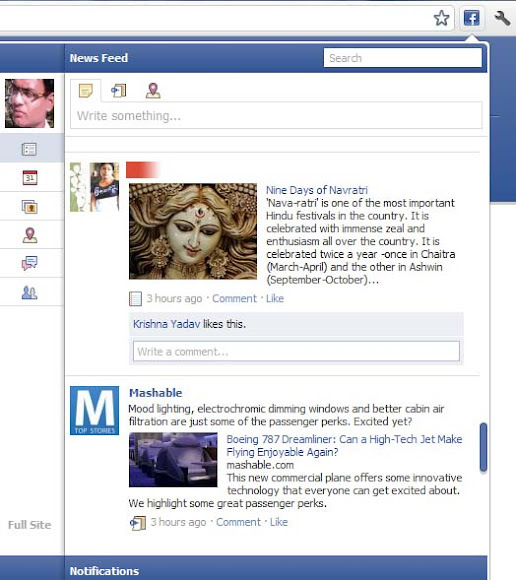 1 brand in social networking site, and Facebook has developed so many things recently in their website. There are so many developers who are developing the extension on browsers. I am sharing a cute chrome extension that will win your heart. When I used it, I really liked it, and I am just tell to its developer a very big thanks. This chrome extension for Facebook, lets you share your wall updates, gets notification for your friends activity, reply messages to your friends and even you can check your friends list without going to Facebook official site. This chrome extension will add a Facebook icon onto the chrome toolbar. No matter, in which website you are, whenever you get notification this icon pop up you with the red integer. I hope you will love it. It will also add "Share on Facebook" in the right click menu. So right click on any link, picture, or page and click "Share on Facebook". It will update as your status, and will be shown the status is via chrome. Therefore, here is a chrome extension to update your Facebook status. You must be open Google Chrome browser, and click on Chrome Extension for Access Facebook. It will open in a new tab. Click on +Free button, and again click on "Add". The chrome extension will now install. After complete installation +Free button will converted to Add to Chrome button. Now you have integrated your chrome browser with this extension, and you will notice that a Facebook icon has been added to your Google chrome browser like the preview mention in the above preview. Now click on Facebook icon(as shown in above preview) from your Google chrome browser(If you are not Log In then Sign In to Facebook) which will prompt browser to open a new window and requesting permission you to allow your Facebook data, so simply click on Allow button. Now you are done. You can do anything with this small icon with surfing other websites or blogs. For firefox users, I have not found any extension like the chrome extension, but you can use this firefox add-on to access Facebook while you are surfing on other web. Each time you want to check your notifications, you have to go on official website or you have to continuously open your Facebook account on a tab. Now, this chrome extension would work for you. You will be notified whenever you have notifications in your Facebook account via a small icon on your chrome browser. You can also post status updates, and you can also check your newsfeed. If you have any other method to surf Facebook without going to official website, you may share with us.